Do you have papers due? Do you need a place to study for exams? 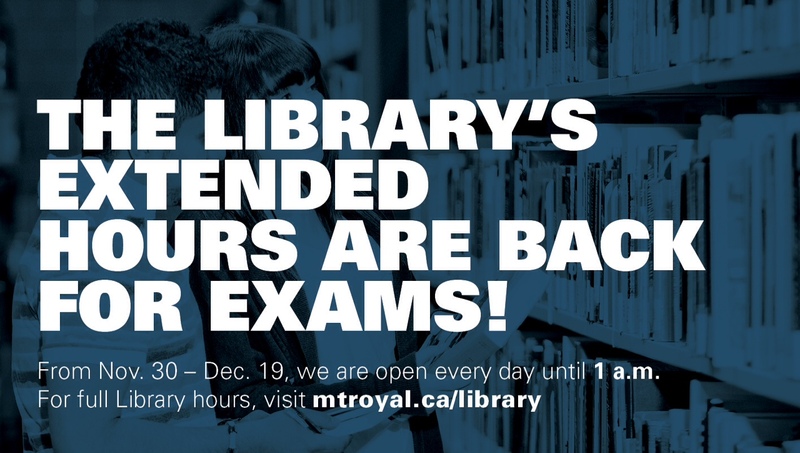 The Mount Royal University Library’s extended hours begin on November 30th and run until December 19th. We will be open Monday-Friday from 7:30am to 1:00am and Saturday-Sunday from 10:00am to 1:00am. Come see us in the evenings for some Tender Library Care (TLC) with free hot drinks, a puzzle table, crosswords puzzles and Sudoku. The MRU Library will NOT be open November 11, 2014 to observe Remembrance Day. Mount Royal University (Lincoln Park, EA, EB, EC and Parkade) will be CLOSED from 6 am to 6 pm. 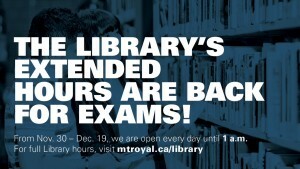 Mount Royal University Recreation is OPEN from 9 am to 8 pm.